From the Biddys collection by Westland Giftware. Biddys Play a Round Figurine. This Item is in stock and ready to ship. 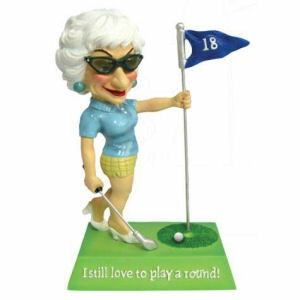 You should not postpone your purchase and miss out on adding Biddys Play a Round Figurine to your Biddys collection! From the Biddys collection by Westland Giftware. Biddy figurine titled Play a Round. Saying on base is I Still Love to play a Round. Measures 6.25 Inches High.